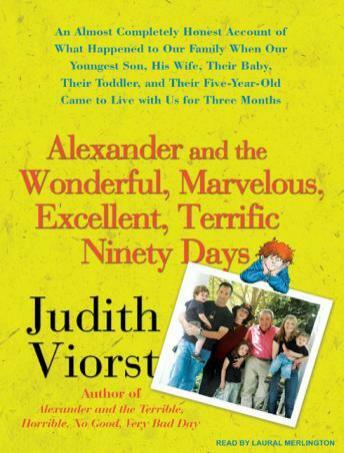 Judith Viorst's most adored book is undoubtedly the children's classic Alexander and the Terrible, Horrible, No Good, Very Bad Day. In this new book, fans will recognize and be drawn to the Alexander they know and love-only now he's all grown up, with three kids of his own. When Judith's son Alexander announces that he, his wife, Marla, their daughter, Olivia (age five), and their two sons, Isaac (age two) and Toby (four months), would be staying with her and her husband for ninety days while their house was being renovated, Judy doesn't know quite how to repond. 'I tried to think of it as a magnificent, once-in-a-lifetime opportunity not only to strengthen family ties and not only to really get to know the grandchildren, but also to further my personal growth while also achieving marital enrichment.' She decides that she'll have to learn to let go of her excessive devotion to domestic neatness and adherence to carefully planned schedules. As Judith's tightly run home turns into a high-octane madhouse of screaming grandkids, splattered floors, spilled milk, and tripped-over toys, she begins to understand that, despite the chaos, what she's been given truly is an amazing thing, an opportunity to know her children and grandchildren a little better than before, but also to reconnect with her husband as they hold hands, close their eyes, and wait patiently for move-out day. When the 'Alexander Five' make a final departure to their newly refurbished home, Judith realizes that Alexander's wonderful, marvelous, excellent, terrific ninety days might have been the greatest gift her son could have given her-the gift of discovering forgotten memories, making loving families, and a chance to live life a little more deeply.